To achieve the whole fruit processing capability, they have extended the length of the squeezing screw (auger) upwards which slices the produce as it is fed in. In our tests this worked really well and the squeezing screw munched through the apples as quick as we could feed them in. You will have to alter the way you introduce the produce when juicing leafy greens though, we found that feeding them in at a much slower speed achieved the best results and chopping them up into smaller pieces cut down on the amount of times the juice extractor blocked up. The screw is made from super tough GE Ultem material which is BPA Free. The B6000 comes with the fine filter screen as standard which is also made from GE Ultem BPA Free material, this works well with all manner of fruits and vegetables but if you are mainly juicing softer fruits like oranges, pineapple, berries etc. - you may find that the optional upgrade kit will serve you well as it includes a coarse screen (smoothie screen) with larger holes which allows for the soft sticky pulp from some fruits to pass through the filter easier. This does result in a thicker juice, much the same as with all juicers but you can strain this down by using a squeeze bag available below or pouring the juice through for a second pass. The large feed-chute cuts down on the amount of time and effort required to chop your fruits and vegetables up which would be required on the other brands of vertical juicer. So if you are mainly juicing fruits and vegetables, the time saved on preparation is noticeable and the produce does pass through the juicer slightly quicker. 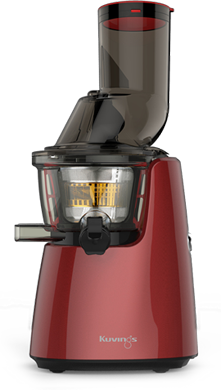 The powerful 240 watt induction motor is more powerful than most other slow juicers but this is definitely required as it has to turn the squeezing screw at a slow 60 RPM to break through the much larger pieces than can be fed in. The motor is backed by a 10 year UK warranty and is CE Certified 220V with UK 3 pin plug. A unique screen cleaning tool is included with this model, it fits around the whole of the screen and by simply turning it in your hand, the stiff bristle brushes pass over all the steel mesh filter cleaning it as it moves. Simply run under running water whilst turning to remove any fibrous material left over from juicing. It also includes a bottle brush and oversize toothbrush. The BPA Free juice bowl features a juice cap which can be left open or closed, this acts as a none-drip spout and can also retain the juice inside the machine to help to thoroughly mix the ingredients together. This is a boon especially when juicing leafy greens as they naturally produce a certain amount of foam which is created by friction from the tough fibrous strands, this is mixed in with the juice so there is no waste. Another added benefit is that water can be fed through the juicer in-between juices to help clean any left-over juice and fibre. Whilst this does not replace a thorough clean, it does help if you are juicing more than once a day or switching between different juice recipes. The optional upgrade kit includes the smoothie screen and an ice cream screen. The smoothie screen has larger holes than the standard screen which results in a much thicker juice, the manual says to use this with semi-frozen or raw fruits and vegetables. This also doubles as the coarse screen for juicing quantities of softer fruits. The ice-cream (blank) screen is for use with semi-frozen fruits to make real fruit ice-cream. The manual says to use neither of the screens for processing anything containing vegetable oil, fat or seeds - so this pretty much rules them out for making nut butters unless you want to invalidate the warranty. The Kuvings Whole Slow Juicer B6000 package contains juice extractor, user manual, vegetable strainer, cleaning tool, bottle brush, large toothbrush, juice collector with measurements, pulp collector and a Free Kuvings juicing recipe book. The Kuvings Whole Slow Juicer C9500 is the first ’whole fruit’ slow speed vertical juicer available in the UK. Kuvings are a well established international brand and have been producing juicers mainly for the European and American markets for over 20 years and better known for their silent juicer range. Featuring a feed-chute the size of those only found on centrifugal juicers, this saves time with preparing the food for the smaller feed-chute varieties found on the competition but with the added bonus of producing a more nutritious and stable juice that can be stored for up to 48 hours. Its practical uses are extended further if you select the optional ice cream screen and smoothie screen upgrade kit below.